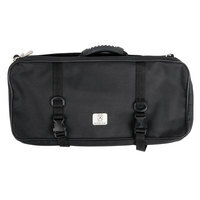 Holds knives with blade length up to 12" and overall length up to 17 1/2"
This attache-type, multipurpose Victorinox 43960 knife case is perfect for safe storage and transport of knives. 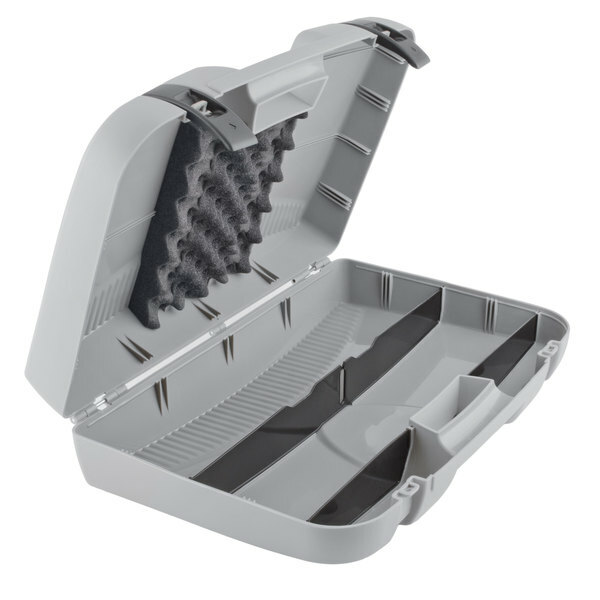 This case is constructed of a hard, gray, polypropylene shell with locking features to ensure long-lasting, durable storage for your most important kitchen tools. 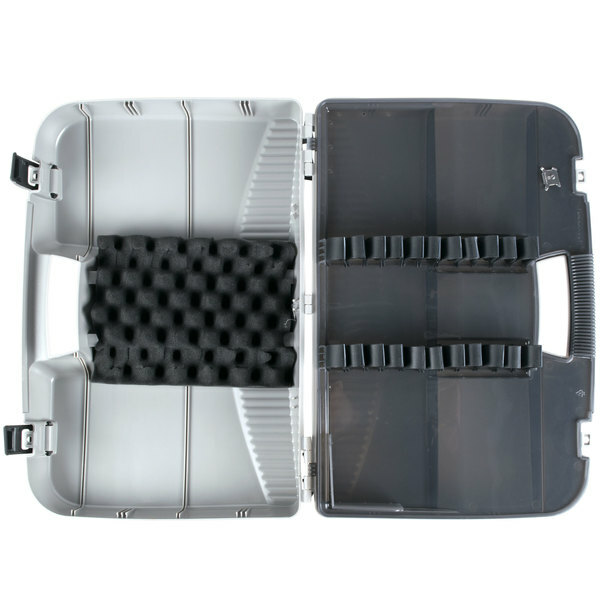 Using a hard case such as this is superior to cloth bags or rolls that succumb to wear and tear much quicker without nearly as much storage possibilities. Plus, it can hold up to 10 knives at a time! This is a wonderful storage system, appropriate for the working professional or student. "Stop reading and buy one already! I have a nice set of knives that I hate putting in a normal knife roll because they can bang against one another. This case solves that and protects my investment for what amounts to a month of pocket change. 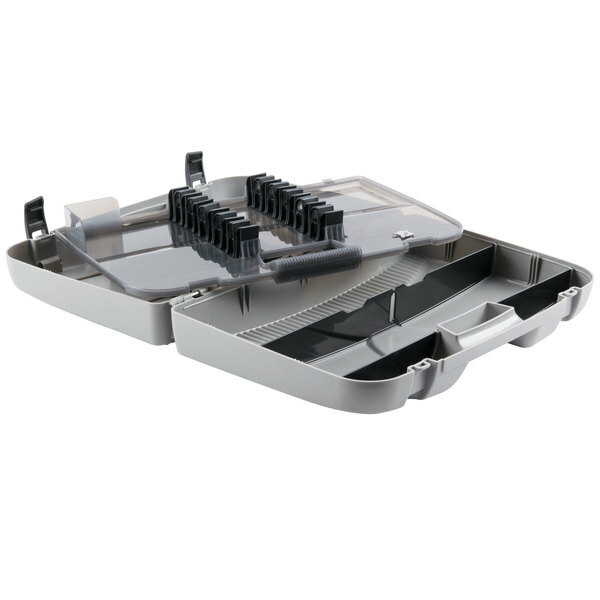 I'll be posting a detailed video review…"
Once your knives are stored in the case, two tabs on the outside lock the case shut. You can hear them click into place so you know your knives are safe and secure. 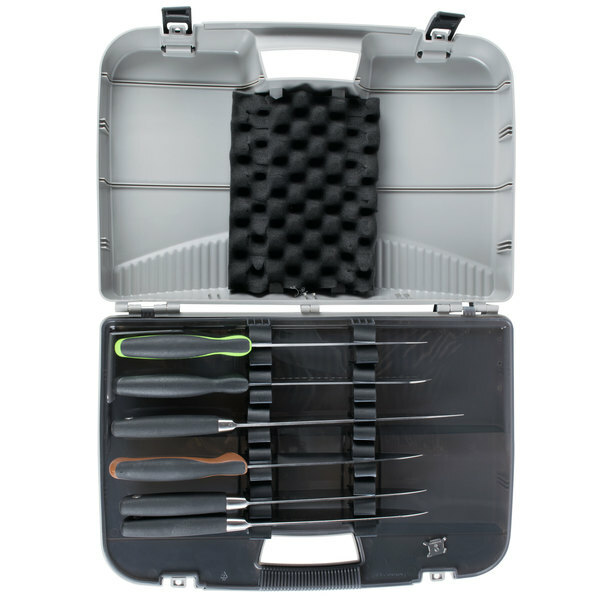 Able to hold knives with a total length up to 12 1/2", or knives with a 12" blade length or less, this case is ideal for holding your most common knives. 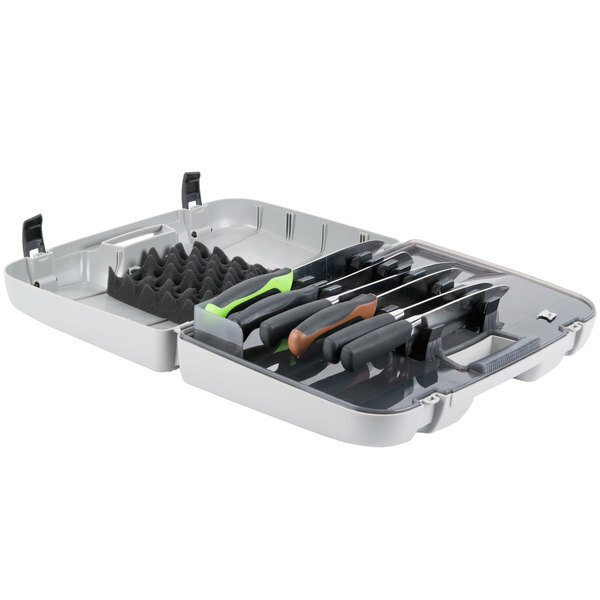 Your most common 10" chef knife easily fits in this case, so you can store all of your necessary cutting tools in this case without a problem. 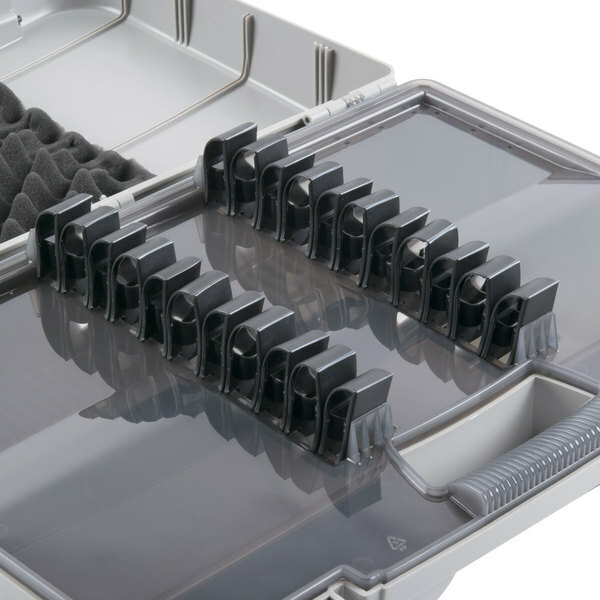 The tray then lifts out to store additional tools, gloves, books, or gadgets in the base. This is great for traveling chefs or cooking students as everything they need will be right at their fingertips. Knife cases are ideal for storing, organizing, and transporting all of your cutlery, ensuring you have what you need wherever you go! Made in a variety of materials, these cases protect your blades from damage and prevent injuries in the kitchen. 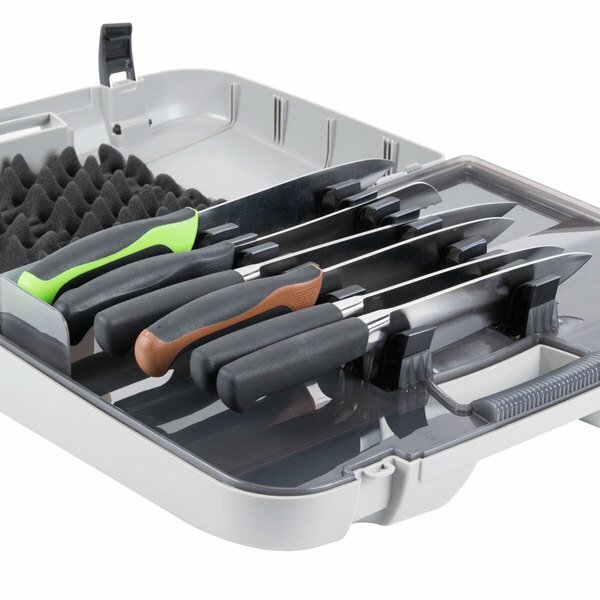 Organize, store, and transport your kitchen cutlery using knife cases, rolls, and bags. 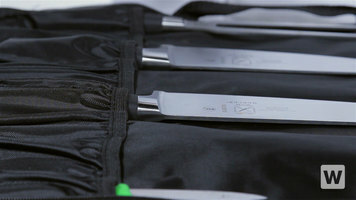 Made in a variety of durable materials, including canvas, nylon, and polyester, these knife cases protect your blades from damage and prevent injuries in the kitchen. 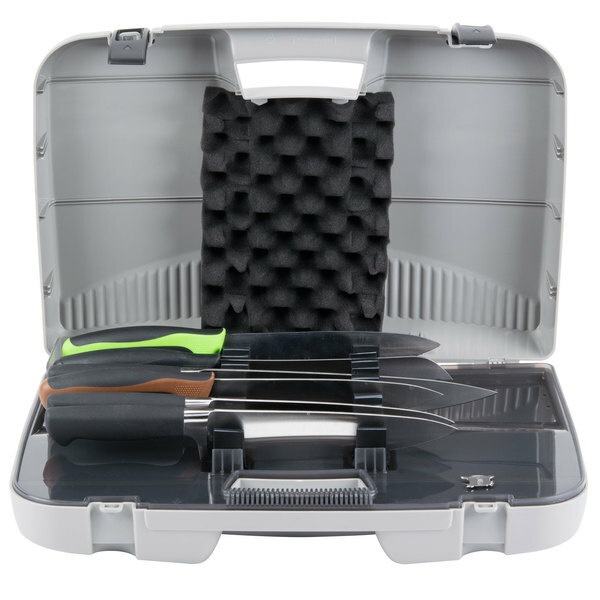 It's easy to move your knives and tools around the kitchen or take them with you when traveling because these cases keep them securely covered and stored out of harm's way. Many of our cases and bags also feature shoulder straps, ID holders, and zippered compartments for added convenience and versatility. 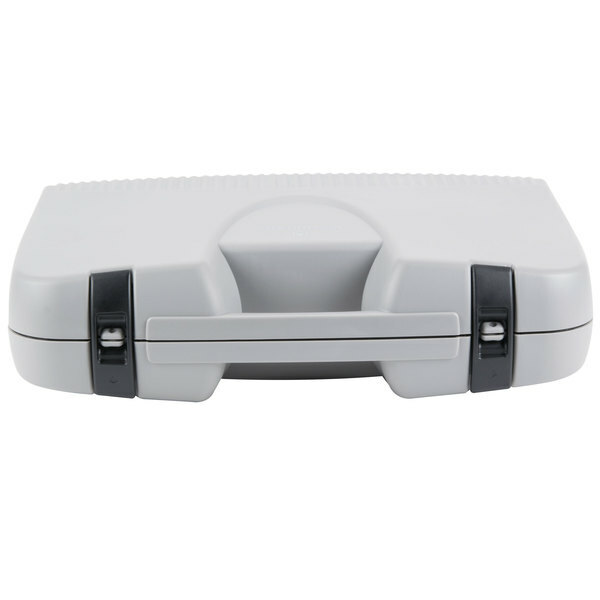 A compact and portable knife case is great for safely storing knives and keeping them on hand when you're on-the-go. 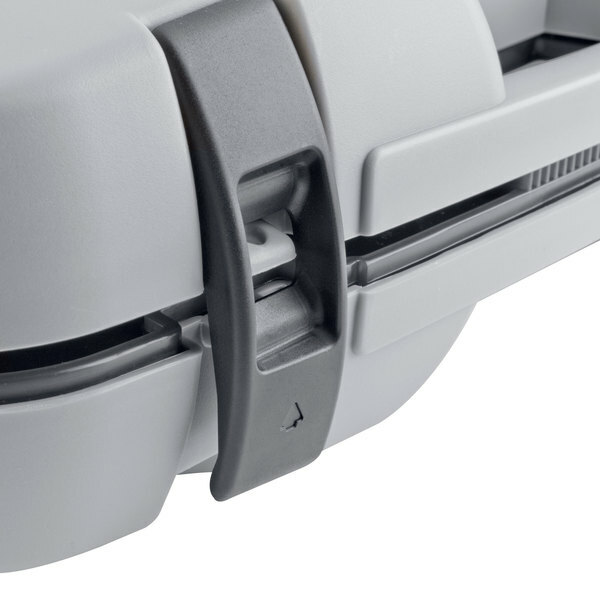 Knife cases feature secure fasteners, like buckles and zippers, which help to keep cutlery securely in place. Each case comes with a number of pockets, which can be large for holding chef knives and slicing knives or small for paring knives. 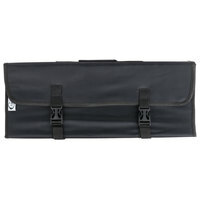 Knife rolls also store cutlery in a compact space and feature pockets for holding large or small tools. Simply roll up the edges and fasten the handles or ties on the end for safe storage and portability. If you have a large amount of knives and tools, consider keeping all of your essential cutlery in a convenient and spacious backpack. A backpack can hold more than one knife case or roll, and features heavy-duty zippers to keep your tools safely in place. The backpack design is easy to carry, thanks to the two arm straps, making it a convenient knife bag when you're traveling. Be sure to check out our variety of kitchen cutlery and knife sharpeners to keep your kitchen fully equipped with all the supplies you need. 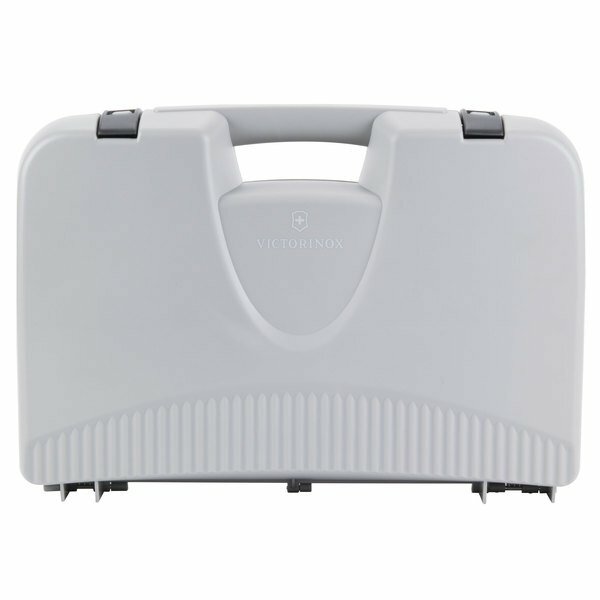 We use the victorinox knife case to carry our knives back and forth from restaurants that use our sharpening service. It holds 10 knives up on top and about 8 knives underneath. It is fairly light, and very practical. Once it is full it can be tricky to close but is very secure. All in all good value. Stop reading and buy one already! I have a nice set of knives that I hate putting in a normal knife roll because they can bang against one another. 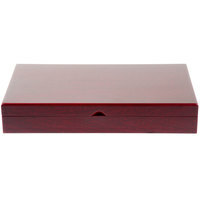 This case solves that and protects my investment for what amounts to a month of pocket change. I'll be posting a detailed video review soon, but take my word and get one. Due to an issue with one of my children we have to lock up all the knives in our house. This case is sturdy, protects a good number of my favorite knives and I can lock it. This is perfect for what I need, especially for the price. Will also work very well when I travel for catering gigs and need to take my knives along. This case is a beast! 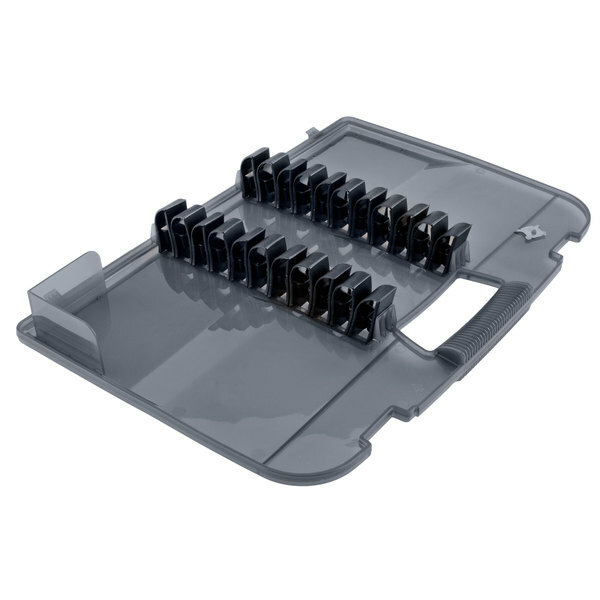 It is made of hard plastic and will be sure to protect your tools in the roughest conditions! A great case to fly and travel with! 10" Chef knives do not fit, as the blade width causes the case to pop open, if you can get it closed in the first place. Would not recommend. Thank you for bringing this to our attention! This case does fit most 10" chef knives with a normal blade width. We have added this to our site for the reference of future customers. I've been very pleased with this knife case. It gives room for knives and other tools that we need for prepping meats for BBQ competitions, and withstands the sometimes rough treatment it might get in loading and unloading. Very large knives don't fit so well and tend to cause the lid to try to pop open a bit, but I just put the 12" knives in another bin. The latches have a hole for a small lock if desired that would solve that problem perfectly, it's just never been enough of a bother for me to go buy the locks. This knife storage case is great. I can fit all of my knives plus a few spatulas and have room underneath for some kitchen accessories. Awesome!. I use it store my Japanese style the whole knives set. Not so good looking at first glance but very practical.I love the additional compartment where I can store my other utensils. This is an amazing knife carrying case. 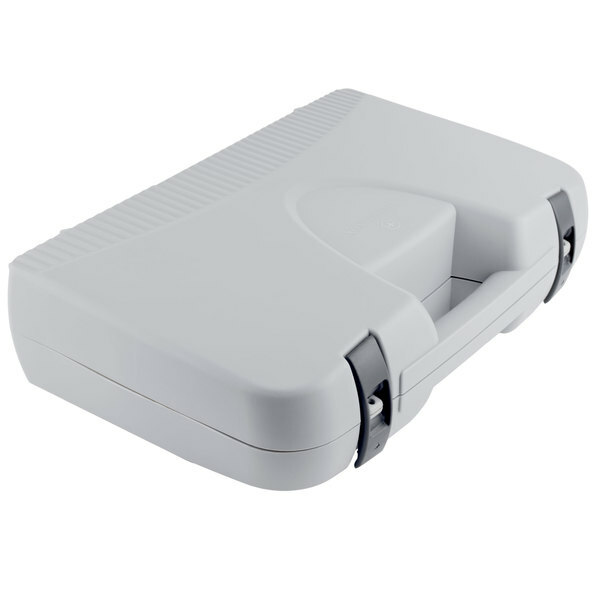 It is lightweight yet durable enough to be used many many times without having to worry about breaking the case!